All my friends and co-workers will tell you that there is no grey in me – am all black and white. My communication is direct, my feedback is direct and what you see is what you get, no hidden agendas. So hardly any grey when you are dealing with me…. except for the past one year. I loved the look as did several of my friends … the jury was divided nearly equally. Several people loved the look and several people hated it. Trust me to change the look as soon as everyone loves this look!. The last one year has been interesting with the grey hair … I was termed “senior citizen”, a young man offered his seat to me, a middle aged security guard brought a chair for me at the RTO office in Hyderabad and a cab driver most recently asked me if I had retired :). Hahahahahaha, I am having too much fun with this look. The cab driver incidentally was taking me to the Mercer office where I was participating in a panel on “Diversity and Inclusion”. While chatting with him he told me that he has ferried Mohit and Rajiv Arora several times in his cab and I said to him that I have worked with both of them earlier. He immediately asked me if I had retired :). I knew right away that, that question would be my blog title. Its quite interesting to see how people react to grey hair – most people assume, you are retired, old (somewhere beyond 50s) and unable to stand for long hours. Especially women with grey hair are “mother” category instantly. They expect me to be motherly, loving, walk slowly, not be internet savvy, not use a smartphone, be forgetful and needing a chair most of the time – hahahahaha, boy, are they in for a surprise when I walk fast, stand most of the time, use a smartphone, remember everything and on odd occasions snap at them too. We associate so strongly with appearances and make assumptions so freely ! Also the way society deals with men and women in this area is quite telling. A George Clooney with grey hair is considered handsome at 20 and at 50, but a woman with grey hair is old at 50 and instantly into the “not-interesting” category. Hey, I have no issues with being old. I realised when I was in my teens that age is immaterial and your chronological age cannot be changed – I am born in 1969 and nothing can change that. I have no desire to be in my 20s, I enjoyed being a teenager, I enjoyed being in my 20’s and I enjoyed becoming 40 and now I am absolutely fine being 47 and turning 50 in three years. Why do we place so much emphasis on appearing young ?? My very dear friend Hareesh wrote me an email as soon as he saw the grey hair saying I have guts to be this way and not color my hair. It made me wonder why I needed guts to be natural … I understand where Hareesh is coming from, he meant it from the way the society and especially women focus so much on looking young, but I do want to question this huge emphasis on appearing young. Every age is beautiful and you learn and mature as you grow older, ok, let me restate that, “hopefully” you learn and mature as you grow older and there is really no charm in being stuck at 21. This is not to say you don’t keep fit or look good or groom yourself as you grow older, its only to say don’t bother about the grey hair and the wrinkles and the reading glasses. Spend that time bothering about becoming a better, stronger and a beautiful person from inside and thats what people will see. For those few people who mistook me to be old and retired, I have many people who have treated me just the same whether I had coloured hair or grey hair. So its no big deal really. I have been getting several second looks because probably I don’t behave “old”, just look “old”. I just love the grey hair, I love the way I look with grey hair and Krishnan loves this look too – and guess what, thats what matters to me. So girl friends – just be yourself, thats when you are your sexiest, most desirable. Don’t care about what the world thinks of being grey, just worry about what you think of being grey and get comfortable in your skin. For too long, men and especially women, have accepted what others have decided about “good looks”… guess its time to redefine it for oneself. hello Mam, Enjoyed reading this. At the age of 34 I got tonnes of grey and I firmly believe to carry on with these since I am comfortable with this emerging, changing look of mine. Your below blog reassures my commitment. 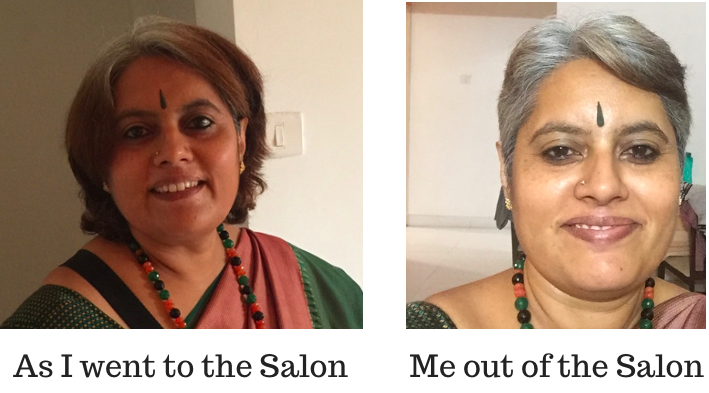 Tweeno – people say you have guts to wear your natural hair color because, like me, you have premature gray. Most folks in their 40s (or even 50s) do not have these many gray in their crowning glory as you and I have. Love you, chica, irrespective of the color of your hair. Yes Anu… agree with your point of view. I am having too much fun with this look :). We will take a pic on our 60th with similar looking hair.